The Trust for Public Land worked with students of P.S./I.S. 111, located in the Hell’s Kitchen neighborhood of Manhattan, to design a new school and community playground on their schoolyard. The new facility now includes a turf field, running track, yoga circle, rain garden, forest walk, outdoor ping pong tables, play equipment, benches, trees, outdoor classroom, game tables, and a color seal designed by the students. The site is open to the public after school and during school breaks until dusk, seven days a week, as part of the Schoolyards to Playgrounds Program. 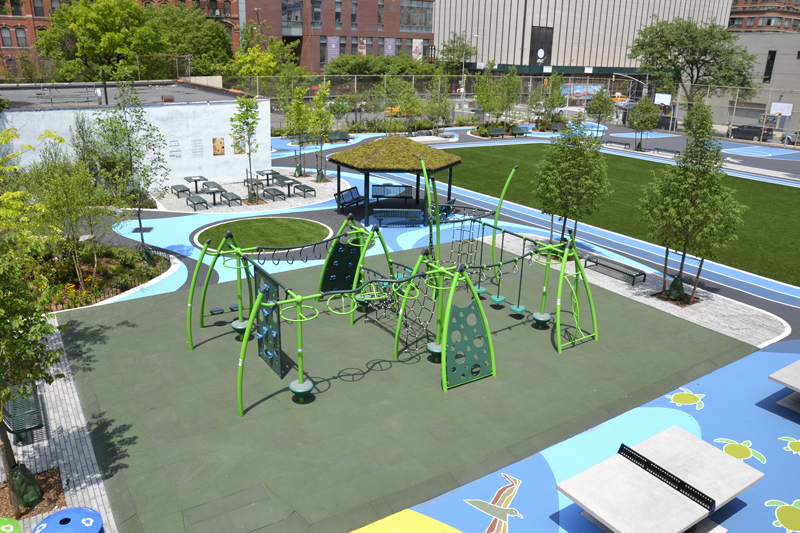 This one-acre playground captures over 700,000 gallons of stormwater per year.